My Coastal Carolina Mommy: Crazy 8 FREE Shipping Today (5/16) Only - Tees As Low As $2.88 Shipped! Crazy 8 FREE Shipping Today (5/16) Only - Tees As Low As $2.88 Shipped! Today (5/16) only Crazy8.com is offering FREE Shipping on any order with promo code SAVEBIG at checkout. 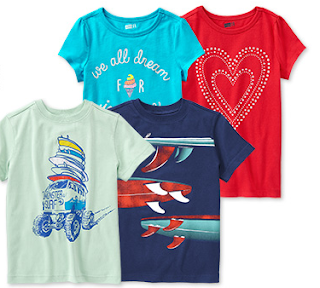 I spotted select Tees priced as low as $2.88 shipped (Retail $10.88)! I also saw some girls dresses and rompers for ONLY $10.88 Shipped (Retail up to $34.88), swimwear priced at $10.99 or less Shipped (Retail up to $19.88), and so much more!